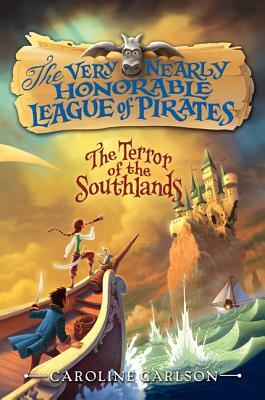 More pirates, more magic, and more adventure in the second book of the Very Nearly Honorable League of Pirates series! Caroline Carlson brings the unceasing wit, humor, and fun of the first book in the series to this epic sequel. Fans of Lemony Snicket’s Series of Unfortunate Events and Trenton Lee Stewart’s Mysterious Benedict Society will love this quirky tween series and hope to join the league just like Hilary! Hilary Westfield is now a bona fide pirate, but when her daring, her magical know-how, and even her gargoyle don’t convince the VNHLP that she’s worthy of her title, the Terror of the Southlands, she sets off with her crew on a high seas adventure. But then Miss Pimm disappears and Hilary decides to find the missing Enchantress and protect the magic of Augusta. Don't miss this adventure-filled pirate romp! Caroline Carlson is the author of the Very Nearly Honorable League of Pirates series and The World's Greatest Detective. She holds an MFA in writing for children from Vermont College of Fine Arts and lives with her family in Pittsburgh, Pennsylvania. You can visit her online at www.carolinecarlsonbooks.com.